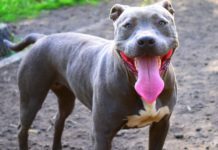 Raw Food for Beginners - How Does it Effect Your Pit Bulls Diet? 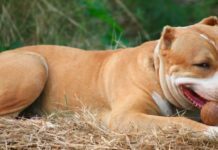 Raw Food for Beginners – How Does it Effect Your Pit Bulls Diet? Under standing the basis or reason behind a raw diet is the best place to start. I have been feeding raw for almost a decade. It was in the early stages of public education at that point. I was forced into it as I had a dog that was allergic to all the grains used in dog foods at that time. She had environmental allergies as well. My vet recommended feeding her a raw diet, he didn’t know anything about formulating them so it was up to me to do the research come up with something. There wasn’t any help that I could find so I experimented. I used millet, and oats for grain, beef and poultry for the meat and a wide variety of veggies. I fed raw bones, eggs, and organ meat as well. It took about 6 months for me to realize that grains just weren’t necessary. I also started thinking about how their wild cousins survived, what they ate and why it worked. The change in her was amazing, her body sucked everything up, she lost a lot of weight, which she needed to do, and she thrived. She had been surviving, that’s about it, all of our other dogs were fed half and half. Our oldest dog at the time was 8, he took to it real well, and ate it for about 3 1/2 years till leukemia got him. To get started on feeding raw it’s best if you slowly introduce raw meat as a treat for the first 3-4 days. Gradually increase the amount you give till they can actually eat a whole meal. If you give them a whole bowl of cut up meat or a raw meaty bone (RMB) they will either vomit or have the runs, or both. I have found with RMB’s they can still get the runs the first time or so you feed them, it’s usually the extra fat on them that causes that. My pup had the runs with his first bone and his first chicken carcass. He’s solid as a rock now and doesn’t react to the introduction of new stuff anymore. One of the benefits to feeding raw is their system is stronger because of it, they don’t have issues with “new” foods or treats. NO raw pork, trichinosis is still an issue unless you are POSITIVE the meat you get is clean. It’s a nasty little worm that does a lot of damage. I don’t feed pork product period, it’s hard for them to digest. NO raw salmon. 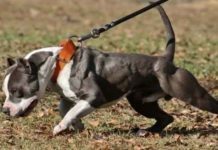 It can have a liver fluke that can potentially destroy your dogs liver. Cooked or canned is fine. One part of feeding raw that happens across the board, unless it’s a young pup, is detox. Their system has to get rid of all the garbage that has built up over years of feeding dry food, good or bad quality. It usually takes a month with the worst case scenarios. They smell, their coat gets dull and brittle, their skin is oily, their breath and stool stinks, then one day, bingo. Beautiful dog. It’s happened to every one of my animals that I have given raw, to one degree or another. Another concern that comes up frequently is bacteria and germs. A dogs system is designed to eat raw food. Their digestive juices are strong enough to break bones down, as a general rule they aren’t very susceptible to e-Coli, listeria or salmonella. The dogs that are going to be susceptible are the very young, the very old and those that are ill. As far as germs go, if you use the same cleaning practices you do with your own food everything should be fine. The dog bowls are cleaned after each meal, the prep surfaces are scrubbed and the utensils are washed. Common sense and good kitchen practices will keep everything in hand. What size portions should I feed? 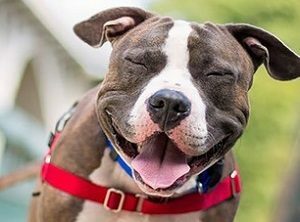 How much you feed will depend entirely on your dog. How active they are, whether they need to lose weight or not, how big they are, and age to some degree. They also will eat like they are starving, which they are, for all intents and purposes. After the detox period they will settle into normal portions unless their activity level increases dramatically. For my 70# pit mix she eats about a pound and a half of raw a day. My pup, who is 6 months and 60# eats about the same as she does. He will eventually get more since he will top out around 85 or so. She’s also 8 so she won’t need as much food as him. My 20# pug eats about 1/2 a pound of raw a day. The meat to veggie ratio, generally, is 85% meat and 15% vegetable. Since bone is free choice I don’t have a percentage for that. The pugs intake is far higher than the other 2 dogs. Organ meat makes up, about, 10% of their diet. I use fresh garlic for flea control, it’s also good for the blood. I crush about half a clove per dog 4 times a week. For vegetable content, I go by color. Orange, green, white, yellow, and red, different colors cover different vitamins. I also don’t worry about balancing every day but rather over a weeks time. I use collard greens, spinach, kale, chard, broccoli, and brussel sprouts for the green. Yams, sweet potato, and orange pepper, turnip, zucchini, yellow squash, radish, cauliflower for white, yellow pepper, the skin of the yellow squash helps with yellow, red is covered by the skins of the radish, a little beet and swiss chard has red in the stems and veins in the leaves. Maybe 1/4 of a yellow pepper. Puree it in a food processor and put into ice trays. Freeze for a couple of hours, separate into zip lock baggies. I will also add cranberries when they are in season. If I remember I will buy 4 or 5 bags when they are available. Apples are also a popular addition to the mix. I know folks that add apple cider vinegar to their mixes as well. It is a preservative, it also acidifies the dog and makes them less attractive for yeast infections. For a 60# dog you can give 4 cubes per meal. I actually feed less vegetable matter, the pug gets 4 cubes every other day. The two pits get them every 4th day, mostly because they eat dry. If they ate straight raw they would get 6 every other day. Most of the fruit they get in their diet comes from treats. When we eat it they get some. The only fruit they should not eat in any way, shape, or form are grapes. Absolutely NO raisins. Everything else is fair game. It’s fun to experiment and see what they will and won’t eat. Sasha doesn’t like Avocado’s, and goes insane for mango and banana’s. As far as meat and how much to feed. For ease of feeding I wouldn’t grind anything. It’s a pain, extremely time consuming and 99% of dogs don’t give a damn what form it is in. Veggies piled on top of hunks of meat goes over just fine. If they are a little reluctant to eat veggies, yogurt or cottage cheese mixed with them usually does the trick. In our house, regardless of which dog is getting the meat, it’s all cut up the same, about 2 inch square cubes. Makes pilling a breeze, they pick up the cube and swallow, never realizing there’s a pill in there. A 3 pound roast with our animals will take care of 1 1/2 dinners. The 2 pits get about 3/4 of a pound each and the pug gets about 1/4 pound per meal. That doesn’t include veggies. Sorry it’s not more precise, I eyeball it most of the time. I judge what needs to change by how they look and act. I use organ meat regularly, they get liver, heart, pancreas, tongue, kidneys. Whatever I can get a hold of. I feed it twice a week as their evening meal, straight organ meat. I do feed dry to the pits so they get raw at night. I will give them veggies a couple of times a week. The pug eats straight raw, we feed a commercially prepared raw food for variety, it has veggies in it so we give him our mix twice a week. They all have bones available all the time. The two pits get half chickens twice a week, Sasha will get half a dry meal in the morning on those days, they tend to be VERY full after they are done. Not that they wouldn’t eat a whole one given the chance, as Garion grows I may end up doing that when he’s an adult. We’ll see how big he gets. Or Chicken leg quarter , or wing sections and breast, or back and breast. Or For a day and a half worth of food in one sitting you could throw the whole chicken carcass at them. It won’t take them any time at all to have that sucker eaten. For dogs with skin issues, the animal fat will help since it goes straight to the skin. Since it’s uncooked they will be able to use it to full benefit. The oil supplements will help as well. Most skin conditions will clear up with a raw diet because it’s fully usable by the animal and actually allows the conditions to heal. 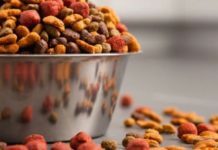 For dogs with severe food allergies you will have to watch for reactions to protein sources, it can be a bit difficult if you alternate protein with each meal or every other day. If there’s a reaction stick to one protein for a 10 day period and see what happens. It will be a process of elimination. I’m not a big fan of supplements. If you are good about using veggies and a variety of color I feel that a lot of the necessary vitamins are covered. The use of bones, organ and muscle meats will take care of the rest. When I store meat in the fridge I will give them the blood that seeps from the meat, it’s full of nutrients. If supplements are given I feel they should be plant based and as natural as possible. I don’t like to see chemical names for vit/min’s. Using oils is a good idea. Flax seed oil or ground flax seeds work well, salmon oils also go over well. 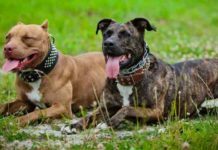 Dogs don’t tend to be terribly picky, so unless there is a particular reason to use one over the other. You could alternate too if you so choose. Be careful when you first start out. Don’t just jump right into feeding raw. It’s always a good idea to get as much information on raw diets as possible. 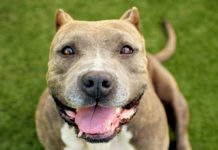 Pit Bull Health Tip: What to Do When Your Dog is Choking?